Sometimes, the simplest affairs are the best. That’s certainly true of the cocktail party. They were delicious. And easy. And they make me wonder what all the fuss is about whenever I have to serve up an amuse-gueule. 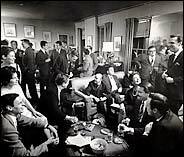 Look at Mr. Plimpton’s party, above. He was notorious for serving up two big bottles of scotch and one of vodka. Hors d’oeuvres were undertaken with reluctance and necessitated the covering of the billiards table in the office of The Paris review (headquartered in his house.) That’s not a lot of anything for a crowd. Except for the booze, of course. Outnumbered, again. The architect makes toast rounds by leaving them in a gas oven overnight. The pilot light “toasts” the bread nicely by the time drinks are served. 1) Wipe with a broken clove of garlic, paint with olive oil and add a sprinkle of oregano, sea salt and toast. 2) Paint with sesame oil and sprinkle with sesame seeds and salt and toast. Serve on a polished silver platter set out next to the drinks. This entry was posted in Entertaining and tagged Entertaining, parties, recipes. Bookmark the permalink. Yummy! This weekend seems as good an excuse as any to try out these little numbers! Mrs PVE, and a good aioli. Can you really go wrong with more garlic and olive oil? Or throw some salsa (drained) on top and call them bruscetta.